March is nearly done and dusted for another year. How it's already that time in the month I do not know. Anyway, here are some posts you've been loving this month! If you missed them the first time or maybe just want to have a re-read, here they are for you. Lip Service-Lip scrubs, lip balms and lip butters. They're all perfect prepping tools to use if you want your lips to be conditioned and moisturised. This roundup of products will have you set, whatever your budget or lip servicing needs may be. The Mac Eyeshadow Palette-After getting annoyed with the clutter of Mac eyeshadows through my makeup bag, I took the plunge and bought one of their palettes to house my shadows. Here's my tips for choosing colours and some suggestions for depotting your Mac eyeshadow or blushes. Hourglass Ambient Lighting Blush-The title says it all really. Towards the end of February, Hourglass's new Ambient Lighting Blushes made their way onto Mecca's shelves across New Zealand and Australia. They are certainly stunning. I picked up Mood Exposure, a soft plum. All the details are in this review but I have loved this blush all month. It's more or less all that's been gracing my cheeks. The French Pharmacy Gems-Escentual's 1/3 offer on French Pharmacy brands was simply too good to ignore. 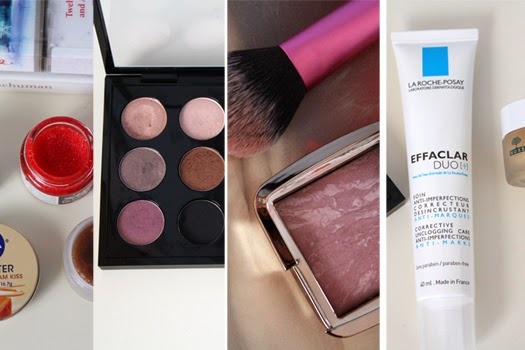 These gems are well-loved by bloggers and beauty lovers alike, so I added them to my basket. So far, I am liking them both. Nuxe's Reve De Miel in particular is going to be so handy in Winter when my lips decide to dry out.